MANILA: Small car segment is one of the most competitive wings of the Philippines auto industry and there are many reasons supporting this fact. First of all, these cars are much easy to own (seeing their nominal price tag) and maintain. Secondly, because of the increasing number of participants in this segment and lastly the ease with which these cars drive through the rush lanes. Well, further intensifying the competition is the updated version of Mitsubishi Mirage that is all set to mark its presence against the likes of Toyota Wigo and Hyundai Eon. Buyers usually lose their nerve under such circumstances and they look for an expert that can guide them in their journey of finding the best commute. Here, through this article we have tried to ease down the pain of choosing amongst the best in the lot. Below you’ll find segment wise comparison that’ll highlight each one’s pros and cons. Out of the lot, it is Mitsubishi Mirage that carries the most appealing exterior attributes. From its honeycomb chrome surround grille to unique fog lamps casing all looks good and stylish. Toyota Wigo on the other hand, displays more simpler design language with minimal yet accurate chrome usage. What gives Wigo an edge over its competitors is its best-in-class ground clearance of 180 mm that allows the car to ride over all on-road obstacles with ease. Hyundai Eon is the one with the most mature looks that are supported by its characters lines and innovative touches present all over its body. What bugs us though is its 2380 mm wheelbase that questions its cabin space and passenger comfort. 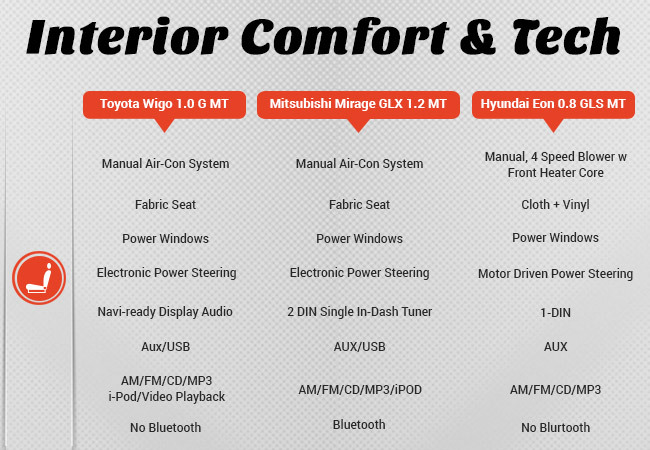 In terms of cabin tech features Toyota Wigo comes with Navi-Ready Display Audio with iPod and video playback capacity. As for Mitsubishi Mirage, though the car also offers 6.5-inch touchscreen infotainment system, it is restricted only to the more expensive GLS variant. But what remains common across the entire line-up is its ergonomic cabin design. Hyundai Eon, despite of its compact built offers a good cargo space and many in-built storage compartments. 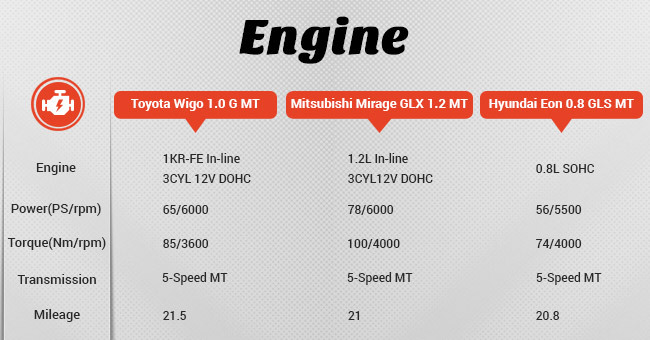 Time to see which one of three holds the biggest mill within and it’s the all-new Mirage that tops the scale with 1.2-litre DOHC gasoline engine. And as can be expected, it is also the one that produces maximum power and torque. In addition, the mill also gives a good mileage rating of 21 kmpl, so ‘high power with big savings’ is the motto here. Next, up is 1.0-litre mill powered Wigo that generates a maximum power of 65 PS along with peak torque of 85 Nm. Also, this one is the most mileage friendly car with 21.5 kmpl mark supporting the claim. Coming to Hyundai Eon, the car houses a 814cc eco-friendly Espilon engine under its hood that via reduced friction and weight delivers a satisfactory mileage rating of 20.8 kmpl. Safety is often overlooked in Asian car buying journey but, this trend is slowly witnessing a change. Now, even the buyer with basic car demands standard safety features. Keeping this in mind Toyota has equipped Wigo with amenities like SRS airbags, ABS, Child Lock Protection, Anti-Theft System and Wireless Doorlock. Mirage on the other hand, comes fitted with front SRS airbags, ABS, Brake Override System and Emergency Signal. Also, it’s worth mentioning that Mirage won ASEAN NCAP Grand Prix award for adult occupancy protection. Coming to Eon, the car is built with radiator support panel, side impact beams and reinforcements on floor panels. All these features ensure maximum protection and least force transfer during any extreme situation. In the end it all comes down to price and what fits best in your requirments scale. 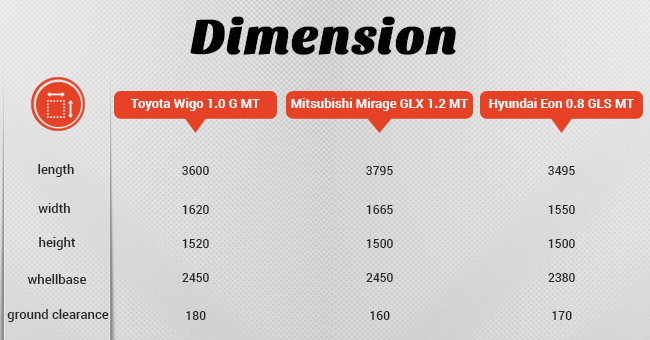 Well, it’s clear that Mitsubishi with its all-new Mirage has given mini-car segment a whole new dimension (added power, more features) that has equally affected its price aspect. Toyota sits in the middle with apt features and digestible price tag. However, it’s Huyndai Eon that holds the most affordable tag that rightfully tallies with its standard features.